I'm all for Drugstore Beauty and I think there are tons of amazing products you can get for very little money, however there are some luxury products that are worth the money. These are my favourite luxury products that have reached holy grail status. Even though they are ridiculously expensive, I would still repurchase. This is my perfect cleanser. It cleans really well, it removes all makeup and moisturizes your skin. My skin is left feeling soft, not tight and dry. Plus it smells really lovely and the balm consistency feels luxurious. I'm not a big user of hair products but this spray makes such a difference to my fine hair. It gives a ridiculous amount of volume and texture. It also smells nice and lasts a long time in my hair. I've talked about this a lot on my blog, but this sculpting duo has become something I reach for most days. The highlight especially is stunning. The bronze shade is also really nice for contouring. Besides the gorgeous rose gold packaging, this lipstick is actually amazing. It's long lasting, but not at all drying. This colour is also really flattering for everyday. These lipsticks smell like vanilla too which is a plus. Finally this eyeshadow stick is really great! It's really shimmery and long wearing but still blendable. I wear this shade for all special occasions because the shade Misty Rock is a beautiful purple-taupe. 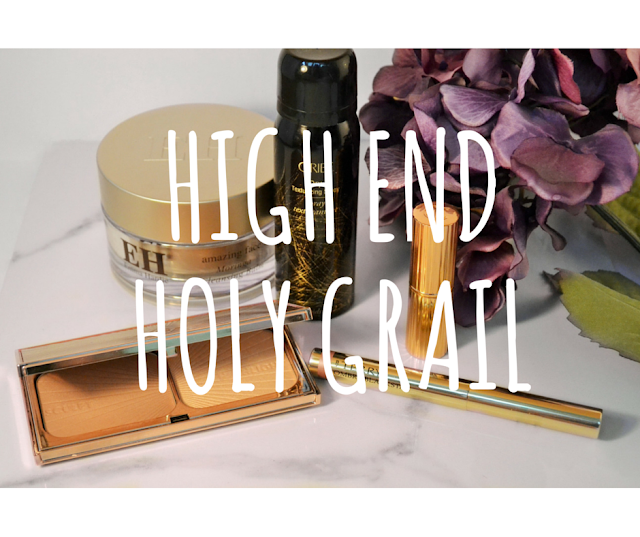 What are your High End Holy Grail products?